The editors of National Geographic Traveler magazine have lauded Beaufort’s Gullah culture, with a spotlight on the Rhett House Inn as the place to stay as one of the top 20 Best Trips in the world to make in 2015. 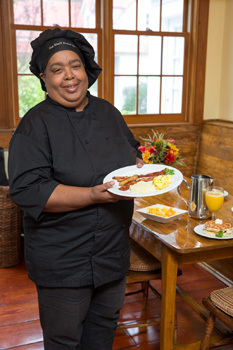 The Rhett House Inn’s Gullah Chef Beverly Mayo’s breakfast is detailed in the article which hits stands this week nationwide. Says Chef Beverly who grew up in the Gullah tradition, cooking with her mother and grandmother in Sheldon. “To us, food is love…you put your love, heart, and soul in it and that’s what makes the difference and the ingredients follow”. She remembers her grandmother making sweet grass baskets by the stove while also turning bread, or churning butter. Adding “At Christmas, we would all cook and give each other presents of beautifully presented food and Christmas cookies”. About working at the Rhett House, Chef Beverly says “The Rhett House has a wonderful spirit, our guests are our first priority, that’s why I love it so.” She’s had guests from all over the world tell her ‘they’ve never tasted grits like hers before’. Her secret? She uses chicken stock instead of plain water, with cream and butter and adds Gullah seasoning at the very end. The recipe is online at www.rhetthouseinn.com. For Christmas this year she’s making cinnamon pancakes in addition to her renowned sweet potato ones. The complimentary breakfast comes with a nightly stay at the Inn. The historic Rhett House Inn, built in 1820 is celebrating its 150th anniversary as an Inn in 2015 and has been a AAA Four Diamond Inn for the past 19 years.